Martinelli Luce Martinelli Luce is an Italian company leader in the field of design lighting, famous above all for the iconic Pipistrello table lamp by Gae Aulenti. The lamps in the Martinelli Luce catalog are characterized by an essential and elegant aesthetic, a true symbol of Italian design and taste in furnishing. Martinelli Luce's proposal for interior lighting is actually very large and is not limited solely to designer table lamps. The proposed lighting systems are always studied in detail, to provide a high quality experience that can transform and improve the atmosphere of any environment. The projects of Martinelli Luce, which are embodied in a collection of lamps and luminous objects that manages to be both classic and avant-garde, are the result of the precious collaboration of the most important Italian and international designers. Interior lighting Martinelli Luce is an Italian company, whose history in the world of lighting design began in the fifties by the will of Elio Martinelli. The project started in fact from a first family company, which had given birth years ago to the father Plinio Martinelli, who in 1929 had decided to start his own company. In 1953, after finishing his studies and obtaining his degree, it was time for Elio Martinelli to join the company, which changed the name to "Martinelli Plinio di Plinio and Elio Martinelli", becoming in effect a company. p> The innovative idea that Elio Martinelli brought into the family company was to create entirely the lighting fixtures and objects, which would then be included in the projects of shops and shops that he himself cared for. The studies of Elio Martinelli, who had specialized in set design at the Academy of Fine Arts in Florence, proved to be extremely useful and decisive in his work on interior design and design. Thanks to this training, he is able to immediately understand the great importance that light has in the definition of an environment, not only in its practical function but also in the atmosphere and in the personality it has to transmit. This is how Martinelli Luce was born, with the aim of producing interior lamps that, over time, also specialize in lighting for private customers. 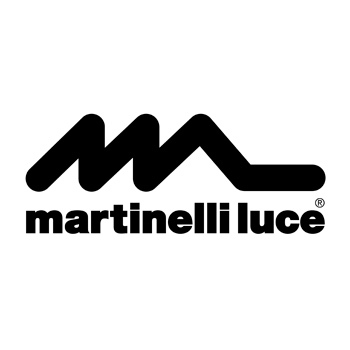 Martinelli Luce lamps are perfect solutions both for homeowners and for public and recreational spaces, such as offices, cinemas, hotels, museums, sales points and shops. Their careful design will guarantee high levels of performance in lighting environments, without ever having to give up energy optimization. Many lamps in the Martinelli catalog, in fact, are available in the LED version, which guarantees an efficient light source both from the point of view of quality and from the point of view of energy saving. Martinelli The lamps of the Italian brand Martinelli Luce are undoubtedly characterized by an aesthetic of the Sixties and Seventies, which recalls the golden years of Italian design and makes them recognizable at a glance. This means that the lamps look anything but dated, but rather the real classics and almost collectible pieces - and, in fact, many Martinelli Luce lamps are exhibited in museums all over the world. The main source of inspiration for Elio Martinelli's first light creations is, without a doubt, nature. In particular, Elio is inspired by the animal world: and then lamps like Serpente, Millepiedi, Dobermann, Cobra and the Rondini are born. But the natural elements are characterized by a certain lightness and elegance, which inspire the creation of lamps like Foglia, Bolla and Nuvole Vagabonde. This tendency to be inspired by everything that catches the eye and stimulates the imagination will be the line of the entire production of Martinelli Luce, also with regard to collaborations with designers and their studies. Inspired by nature, geometric shapes and material encounters, the designer lamps are innovative and at the same time manage to put themselves with the same strength and elegance of a lighting classic. Table lamps Martinelli Luce table lamps are an example of refined and purely Italian design. The elegance of these lamps is combined with a breath of novelty and unexpected, which is expressed in a detail or in a form that you would not normally expect to find in a lighting object. Martinelli Luce is an Italian company leader in the field of design lighting, famous above all for the iconic Pipistrello table lamp by Gae Aulenti. The lamps in the Martinelli Luce catalog are characterized by an essential and elegant aesthetic, a true symbol of Italian design and taste in furnishing. Martinelli Luce's proposal for interior lighting is actually very large and is not limited solely to designer table lamps. The proposed lighting systems are always studied in detail, to provide a high quality experience that can transform and improve the atmosphere of any environment. The projects of Martinelli Luce, which are embodied in a collection of lamps and luminous objects that manages to be both classic and avant-garde, are the result of the precious collaboration of the most important Italian and international designers. The innovative idea that Elio Martinelli brought into the family company was to create entirely the lighting fixtures and objects, which would then be included in the projects of shops and shops that he himself cared for. The studies of Elio Martinelli, who had specialized in set design at the Academy of Fine Arts in Florence, proved to be extremely useful and decisive in his work on interior design and design. Thanks to this training, he is able to immediately understand the great importance that light has in the definition of an environment, not only in its practical function but also in the atmosphere and in the personality it has to transmit. This is how Martinelli Luce was born, with the aim of producing interior lamps that, over time, also specialize in lighting for private customers. Martinelli Luce lamps are perfect solutions both for homeowners and for public and recreational spaces, such as offices, cinemas, hotels, museums, sales points and shops. Their careful design will guarantee high levels of performance in lighting environments, without ever having to give up energy optimization. Many lamps in the Martinelli catalog, in fact, are available in the LED version, which guarantees an efficient light source both from the point of view of quality and from the point of view of energy saving. The lamps of the Italian brand Martinelli Luce are undoubtedly characterized by an aesthetic of the Sixties and Seventies, which recalls the golden years of Italian design and makes them recognizable at a glance. This means that the lamps look anything but dated, but rather the real classics and almost collectible pieces - and, in fact, many Martinelli Luce lamps are exhibited in museums all over the world. The main source of inspiration for Elio Martinelli's first light creations is, without a doubt, nature. In particular, Elio is inspired by the animal world: and then lamps like Serpente, Millepiedi, Dobermann, Cobra and the Rondini are born. But the natural elements are characterized by a certain lightness and elegance, which inspire the creation of lamps like Foglia, Bolla and Nuvole Vagabonde. This tendency to be inspired by everything that catches the eye and stimulates the imagination will be the line of the entire production of Martinelli Luce, also with regard to collaborations with designers and their studies. Inspired by nature, geometric shapes and material encounters, the designer lamps are innovative and at the same time manage to put themselves with the same strength and elegance of a lighting classic. Martinelli Luce table lamps are an example of refined and purely Italian design. The elegance of these lamps is combined with a breath of novelty and unexpected, which is expressed in a detail or in a form that you would not normally expect to find in a lighting object.